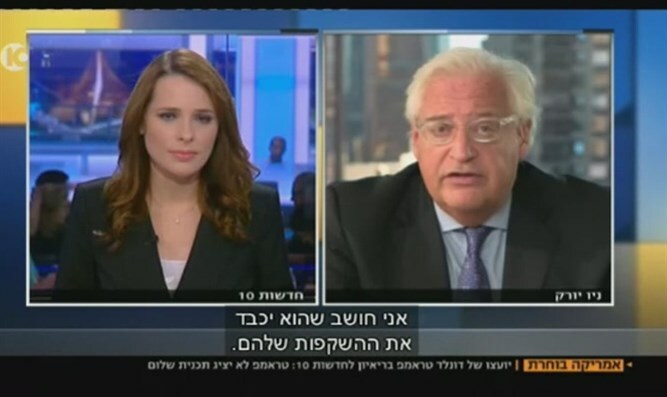 David Friedman, Trump’s adviser on Israel affairs, says the United States should let Israel decide how to solve its conflict with the PA.
David Friedman, Republican presidential nominee Donald Trump’s adviser on Israel affairs, said on Wednesday that if Trump is elected president, he will not try to force a solution on Israel with regards to its conflict with the Palestinian Authority (PA). “Unless and until they come to him seeking help, I think he’s going to respect their views,” Friedman told Channel 10 News. “Israel is an ally and a partner, and they’re a partner in a very important task – the joint effort to defeat radical Islamism. So it’s not in the United States’ interest to weaken Israel or to cause Israel to be distracted by the political wishes outside of their own country,” he added. “We’re going to respect the democratic process in Israel,” stressed Friedman.